It’s here! 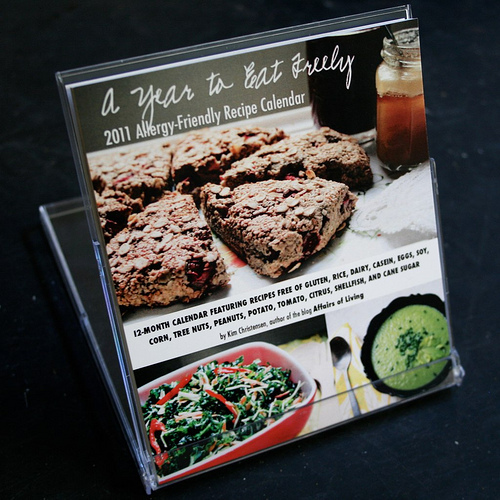 Please give a warm welcome to A Year to Eat Freely: 2011 Allergy-Friendly Recipe Calendar. It’s a 12-month calendar packed with 17 allergy-friendly, gluten-free recipes, and was written, photographed, and designed by yours truly with lots of love. Eat freely all year with this allergy-friendly 12-month calendar, featuring 17 nourishing whole foods recipes free of gluten, rice, casein, eggs, soy, corn, tree nuts, peanuts, potato, tomato, citrus, shellfish, and cane sugar. Sure to please vegans and meat-eaters alike, these recipes are easily adaptable and offer multiple options for seasonings and sweeteners, making it easy to adapt to your tastes and needs. In addition to great recipes, I’ve included a tailored ingredients guide to help you navigate the more uncommon ingredients as well as helpful tips and additional recipe suggestions along the way. 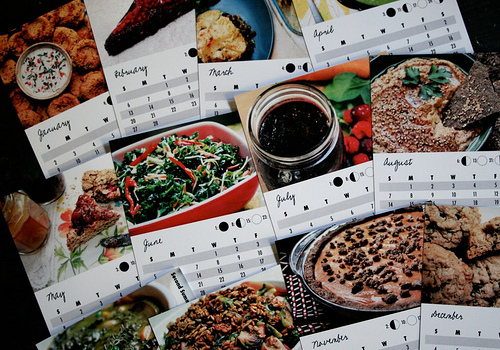 Printed on individual cards and packaged in a jewel case, each month features a full-color photo, calendar, and complete recipe. Jewel case flips open to function as a calendar stand, perfect for desks, kitchen counters, or other workspaces. After the year is over, close the case and use it to store your recipe cards for years to come! It is the perfect gift suggestion for anyone with Celiac Disease, food allergies or intolerances, on healing diets, or for individuals who simply enjoy wholesome and nourishing real food. Price: $10 + shipping/handling. For more information and to purchase, head on over to my Etsy shop My Little Ideas. I’m excited to share these recipes with you and created this calendar with love. I hope that you are able to enjoy these recipe for years to come with friends and family, and that they can inspire you to explore the ways that nourishing food can help you reclaim your health. Now the fun part – I’m giving away two calendars to two lucky readers. Yippee. • Leave a comment on this post on my main blog and tell me which recipe you’d like to try first! • Post about this giveaway on Facebook and link back to this post, and leave a comment on my main blog telling me that you did. 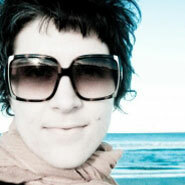 • Become a “fan” on my blog’s Facebook page and leave a comment on my main blog that you did. • Write about this giveaway on your blog and link back to this post, and leave a comment on my main blog telling me that you did. Please make sure you leave an e-mail address when leaving your comment so I can contact you if you win! The more things you do, the more chances you have to win! I will select a winner through a random number generator. Contest closes Saturday, October 16 at 9 pm CST. Winners will be announced Sunday, October 17. Good luck! Kim, your calendar looks absolutely stunning!! I couldn’t help myself and entered the contest myself! Beautiful job – makes me even more excited to see your book, when it does come out. Congrats!! !